The Barkhor Street: It is a flourishing street around jokhang Temple. Along the steet are stores and groceries selling light industry products and handicrafts made by locals or Nepal makers It is also the main route for prayerwheels rotaing. Today we will drive out of Lhasa to Gyantse. When arrive in Gyantse, we will visit Palkhor Monastery . Palkhor Monastery: It has an unusual structural style and houses a collection of pure silk costumes worn in Tibetan opera, all richly embroidered, that date from the Ming and Qing Dynasties. After breakfast we will drive to Shigatse. Go for the tour of Shalu Monastery on the road. 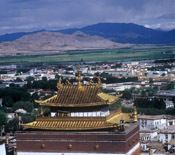 Upon arrival in Shigatse, you will visit the Tashilumpo Monastery. Tashihunpo Monastery: Traditional seat of the Panchen Lama and one of Tibetan culture’s six great Gelugpa institutions. Shalu Monastery: Shalu was the first of the major monasteries to be built by noble families and was an important center of the Sakya tradition. Drive via Pangla Pass to Rongbuk Monastery, and go for the tour of Mt. Everest Base Camp. In the afternoon, you can drive back to Tingri. Rongbuk Monastery: Located at the foot of Mt. Everest, it is the highest temple in the world. Definitely here is the best spot for Mt. Everest photography. Mt. Everest Base Camp: To protect the entironment of the area, EBC is set on the south of Rongbuk Monastery, providing the accomadation, toilets and even a post office (hightest in the world) for the tourists.